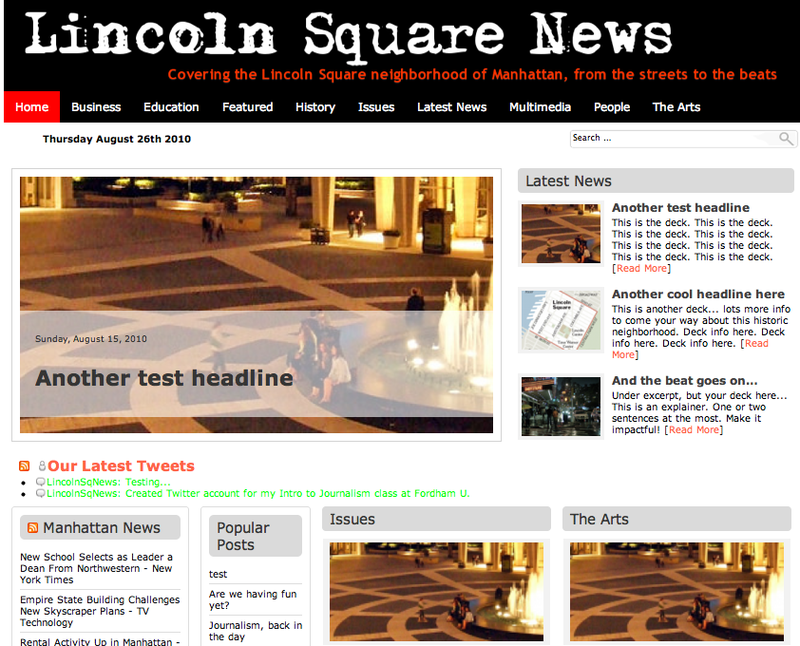 The beta site for my class website is up: LincolnSquareNews.org. It’s under construction. Under my list of things to do: create a nicer header with perhaps a logo. Or maybe a header that is a mashup of photos taken by my students? I still want to move around some content and add better widgets. I’m on the lookout for a news ticker that would give me local feeds, with a dash of national and international headlines. But I must get back to my master’s thesis and once I’m done (end of August! ), I’ll be able to spend more time playing with the CSS. We’ll be running a hyperlocal site that focuses on the historic neighborhood of Lincoln Square. Heck, it’s so historic, I didn’t even know it was an official neighborhood. It’s always been lumped into the Upper West Side. The boundaries have changed a bit since it was first declared a neighborhood, back in 1906. Back then, it was a short square, confined by Columbus and Amsterdam Avenues between 63rd and 66th street. 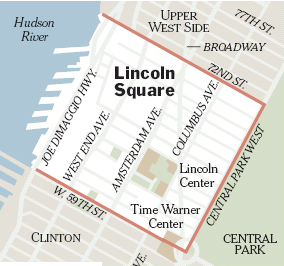 Today, the Lincoln Square Business Improvement District has a map that defines it as starting at Columbus Circle, moving north along Broadway to 70th street, then back down south, along Amsterdam, but the city defines it slightly differently, and so do realtors and Almighty New York Times, which has kept better historical records of the city than City Hall. Besides, a square isn’t a square unless it’s a square. So, for the purposes of this class we’ll be defining it as the same way the Times does, from 59th Street on the South, to 72nd Street to to north, along Central Park West on the East, and the Hudson River on the West. And now to answer the question… Lincoln what, Lincoln who? Guess who Lincoln Square was named for? It’s a mystery, according to this cool piece that ran in the NYT last year. You’ll find it right after the jump. Breaking ground for Lincoln Center on May 14, 1959: President Dwight D. Eisenhower did the honors, after Leonard Bernstein conducted the New York Philharmonic in a makeshift tent. Certainly there is no doubt, she said, that it was decided, in 1956, to name Lincoln Center after the neighborhood in which it was built: Lincoln Square, formally the area between Columbus and Amsterdam Avenues between West 63rd Street and West 66th Street. After all, in 1906 the Shubert Organization opened a 1,600-seat theater there called the Lincoln Square, on what is currently the site of the Juilliard School. There was even a six-story loft, the Lincoln Square Arcade, where painters, sculptors and photographers toiled in studios for many years. Was Lincoln Center really named after the Great Emancipator? Records conclusively show that the New York City Board of Aldermen formally named the area Lincoln Square in May of 1906. The minutes of their meetings are devoid of discussion, however, about the reason for the name. Newspapers of the time, including The New York Times and The Brooklyn Eagle, shed no light on the question, Ms. Johnson said. As to whether Honest Abe provided the inspiration, “we couldn’t find anything that was conclusive one way or the other,” she said. But the property records in the New York Municipal Archives list six local landowners in the area, and nary a Lincoln surname among them: Thomas Hall, Johannes van Bruch, Stephan de Lancey, James de Lancey, James de Lancey Jr. and John Somerindyck. “We searched obituaries, archives of the parks department and many other records and couldn’t find any landowner with the name of Lincoln,” Ms. Johnson said. The whole Lincoln name thing gets even trickier. When the Board of Aldermen granted Lincoln Square its name in 1906, during a time that the city was designating many named squares, the city’s mayor was George B. McClellan. George B. McClellan, son of the Civil War general, was mayor when Lincoln Square was named in 1906. “There is the wonderful irony,” Mr. Holzer said of the possibility that Lincoln Square was named after the president during the tenure of a New York mayor who was “the son of the general who gave Lincoln more difficulty than anyone during the Civil War — the McClellan who opposed emancipation and ran against Lincoln in 1864.” Yet if the general had been insulting to Lincoln, the president was also uncharacteristically harsh in referring to McClellan, terming the glacially moving general’s Army of the Potomac “McClellan’s bodyguard,” Mr. Holzer said. “One has to reasonably assume that the square was named for Abraham Lincoln,” he added, but the dearth of references to the president in the records could have been inspired by the legacy of enmity between the general and the commander. “Perhaps they played down the connection to President Lincoln in deference to the sensibilities of the McClellan family,” Mr. Holzer said. Nota bene: any of those (and there are some) who think that the center was named after Lincoln Kirstein — the balletomane and onetime director of Lincoln Center for three years who had previously been a founder of the New York City Ballet and the School of American Ballet with George Balanchine — could not be more wrong. But quite interestingly, Mr. Kirstein was “a Lincoln collector who wanted very much to have the fountain on the plaza surround a sculpture of Abraham Lincoln, which he proposed, based on a model of a sculpture he had in his own collection,” Mr. Holzer said. The idea was never realized. In the end, all such considerations will count for little when the celebration begins in Alice Tully Hall with a performance of “Fanfare for the Common Man” by Aaron Copland (a nod to a more verifiable, non-Lincolnian tradition: that Leonard Bernstein had that theme played at the 1959 groundbreaking). Then, Audra McDonald will sing. Itzhak Perlman and Wynton Marsalis will play. Tom Brokaw will be the anchorman — er, host. The mayor, the governor and New York’s senior senator are expected to speak. And all the while, the festivities will be streamed, live, on the Lincoln Center Web site. But none of the revelers will resolve the obscure question of how Lincoln Center got its name. Next Post Where have all the issue stories gone?